Gamma (Γ) distribution calculator, formulas, work with steps & solved examples to estimate the probability density function (PDF) of random variable x in statistical experiments. By using this calculator, users may find the probability P(x) & expected mean (μ) of gamma distribution. This probability density function (pdf) calculator is featured to generate the work with steps for any corresponding input values to help beginners to learn how the input values are being used in such calculations of gamma distribution. The below are the important notes to remember to supply the corresponding input values for this gamma function calculator. The random variable x is the non-negative number value which must be greater than or equal to 0. 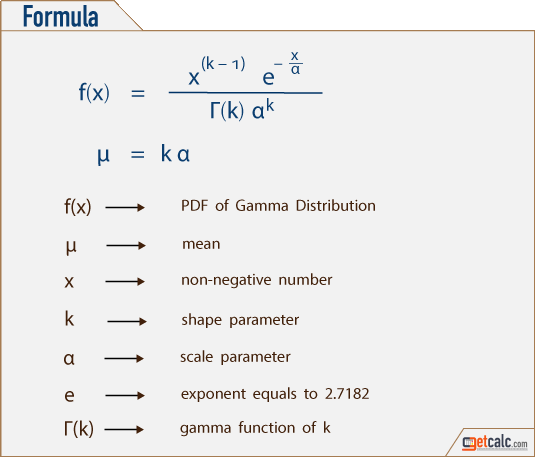 The gamma function is evaluated at this random variable x.
Gamma distribution is a continous probability function used in statistics to analyze the reliability of products or services. It's relies on gamma function, often represented by the Geek symbol Γ. It's used in statistics & probability to characterize the event of nth failure arrival over a period of time. The Gamma function generalizes the idea of factorial. An exponential distribution is the specal case of gamma distribution while the shape parameter α = 1. In this calculation, the term P(x) represents the probability of random variable, mean (μ) represents the average time between the event of failures among the group of data. The below formula is mathematical representation for probability density function (pdf) of Gamma distribution may help users to know what are all the input parameters are being used in such calculations to characterize the data distribution. Users may use these below gamma distribution formulas for manual calculations and use this calculator to verify the results of manual calculations or generate complete work with steps. The below are some of the solved examples with solutions for probability density function (pdf) of Gamma distribution to help users to know how to estimate the reliability of products and services. A random variable x = 15 follows the gamma distribution which has the shape parameter α = 1.5 and scale parameter k = 5. Find the probability density function P(x) for the random variable x? A gamma distribution which has the shape parameter α = 9 and scale parameter k = 3. Find the probability density function P(x) for the random variable x = 11?